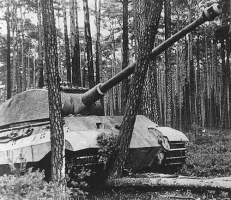 The German Tiger II is a heavily armored tank that when properly angled or sidescraped makes for a formidable anchor in a line. One of the most feared tanks in the Second World War, it operates rather bad in stock configuration. 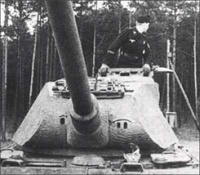 With proper positioning it is capable of bouncing shells off its sturdy sloped front armor, provided that its lower front plate is hidden at all times as it is only 120mm thick. While it does have a workable level of mobility it is prone to engine damage if the lower plate is hit which can decrease overall speed. Due to the precision of German guns, it is an excellent sniper with superior accuracy and a great rate of fire which can be extremely effective when engaging enemy vehicles from distance. With the sloped armor, if properly angled the Tiger II can have the upper hand as it's armor can be difficult to penetrate. The side armor of this tank is weak and great care should be taken when exposing it straight on to enemy fire. Hull down this tank has moderate success, however someone with an accurate gun who knows what they're doing will be able to hit and penetrate your weak commander's hatch. . 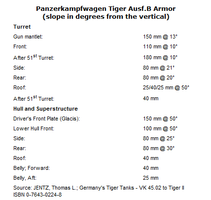 The Tiger II more or less plays like the tier 7 Tiger, but with greatly improved armor. 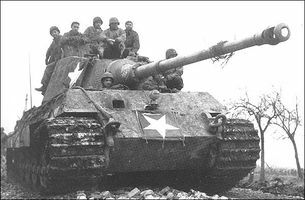 It can hold its ground, should it be challenged in a close-ranged engagement; however as with the Tiger it is recommended that you try to keep enemies at range since your sides and lower front plate are too vulnerable in a brawl. 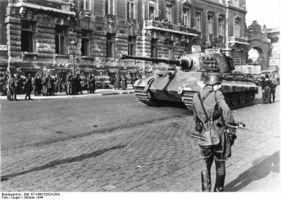 PzKpfw VIB Tiger II can hold it's own against some Tier IX tanks but should show caution when going against the higher calibre TD guns. When found in high tier matches this tank should be used as second line support or as a sniper moving with the flow of the battle to keep the high calibre gun in play. 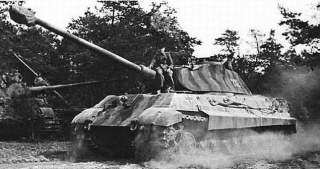 Making use of the well-engineered armor and the superior accuracy of its gun, high penetration and (uncommon for Germans) good gun depression, use cover and fight at range. 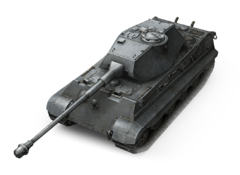 If played well, this tank can fight any tank of the same tier and win and be a challenge for higher tiers. You are going to have a huge impact on the outcome of the battle. Don't be surprised if many of your team tanks follow you wherever you go. Plan to spearhead the main attack. If you're forced into a defensive role, go where your line is weakest and use every opportunity to abuse the angles of your armor via sidescraping or hull down tactics. 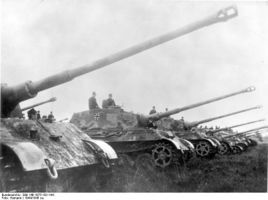 Then the vast majority of enemy tanks will be tier 9. You'll need to target vulnerable areas of the enemy tanks. Otherwise, you won't stand a chance. Try to stay alive and you might make more of a difference once the strongest tanks kill each other off. Snipe only until lower tier tanks remain. Definitely equip the Rammer and Vertical Stabilizer. After that choose between Vents, Enhanced Gun Laying Drive, or if you experience ammo rack trouble, the Wet Ammo Rack. This page was last modified on 11 July 2016, at 05:36.